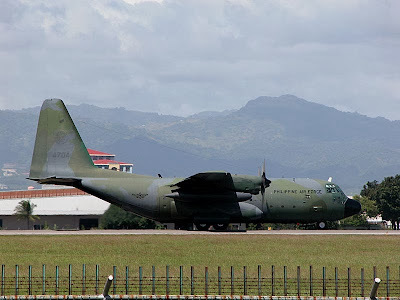 MANILA, Philippines–The Armed Forces of the Philippines (AFP) is in the process of acquiring two more C-130 cargo planes. Once bought, there will be five C-130 planes in the Air Force inventory. AFP Chief of Staff General Emmanuel Bautista said on Monday that there should be nine C-130s in order to say that the military has enough. “The Air Force told me that they will be happy if they will get nine C-130s. So we have three and we are trying to acquire two more. So we will try to get more,” he told reports at Camp Aguinaldo. The three C-130s have been the workhorse of the Air Force in the ongoing relief operations for typhoon-battered areas. It ferries relief goods and residents of typhoon-stricken areas who want to be evacuated. The local cargo planes can carry as much as 200 persons. Dozens of foreign C-130s have also been helping in relief efforts. “In terms of strategic lift the C-130 is important. We saw how it helped during calamities. It’s not just for military operations but for other operations other than war such as rescue and relief effort,” Bautista said. Defense Secretary Voltaire Gazmin also revealed in his speech on the sendoff for BRP Ramon Alcaraz last Friday the plans to procure two more C-130s. Bautista added that they are also trying two acquire two logistics support vessels and strategic sealift vessels. “In addition to our sealift vessels, only two are used as logistics vessels so we are acquiring two strategic sealift vessels. In fact we need more and we will try to acquire more as resources allow us,” he said.